Mountain lions, otherwise known as cougars, are ferocious predators capable of dwelling in almost any terrestrial habitat. Native to the Americas, mountain lions are large, solitary cats whose predatory abilities allow them to become the master of the local food chain. Within their large territorial expanses, these cats have developed adaptations to live in the harsh deserts of the Western hemisphere. Through elite stalking and ambushing hunting behavior, the mountain lion preys on a wide variety of animals. Main sources of food include deer, elk, moose, sheep, cattle and horses. However, mountain lions also will hunt smaller organisms such as insects and rodents. The mountain lion’s diverse diet enables it to survive in the bleak conditions of the desert, where wildlife isn’t plentiful. By patiently waiting and ambushing its prey, the mountain lion has developed the hunting prowess to survive in scant environments. The adult mountain lion is the fourth largest of cat species, capable of standing two and a half feet at the shoulders. As a slender and very agile member of the cat family, mountain lions are built to hunt and kill. They also possess a wide variety of physical adaptations that increases their efficiency during hunting. Large neck and jaw muscles allow mountain lions to grasp and hold prey, while large hind legs enable awesome leaping capabilities and short-range sprinting. 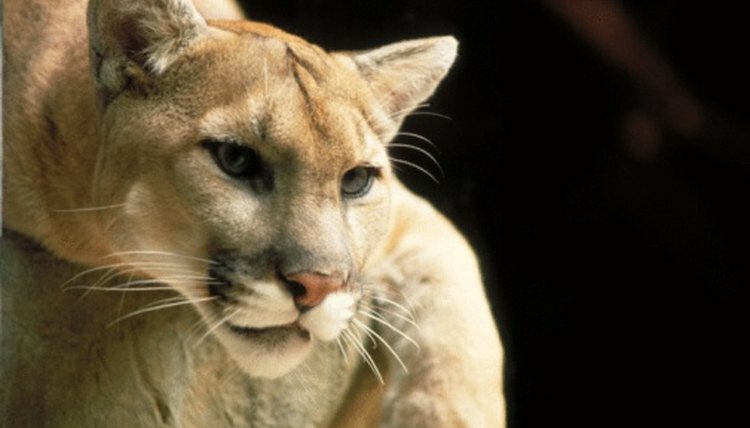 These traits have allowed the mountain lion to kill many animals, even in the desert. 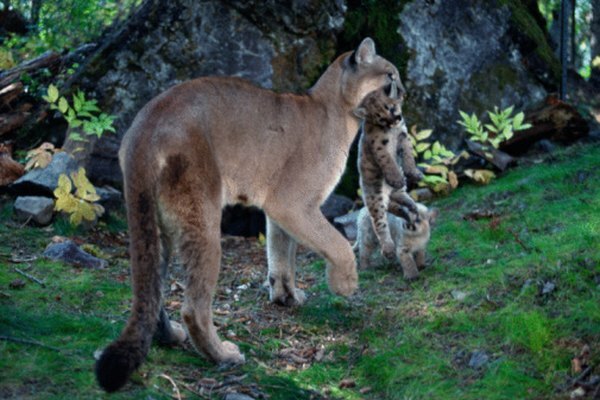 Only female mountain lions become involved in parenting. Consequently, females are ardently protective of their own cubs, and often are willing to fight off larger predators in defense. Mountain lions prefer to establish their dens in rocky alcoves and caves, which offer protection and cover from the weather. The mountain lion’s devoted care to its young reflects an adaptation which increases their survivability in the wild. Mountain lions are solitary predators whose hunting ranges can extend to 300 square miles. As a secretive species, mountain lions prefer to hunt around dawn and dusk, where prey can be caught unawares. The large expanse of the home range allows for greater versatility in drier climates such as the desert. When food sources are scarce in one area, the mountain lion can wander further outwards to hunt at more plentiful areas. Based in Pleasanton, Calif., Joshua Liu has been writing animal- and health-related articles since 2010. His articles have appeared on eHow. Liu is pursuing a Bachelor of Science in bioengineering at the University of California, Berkeley.